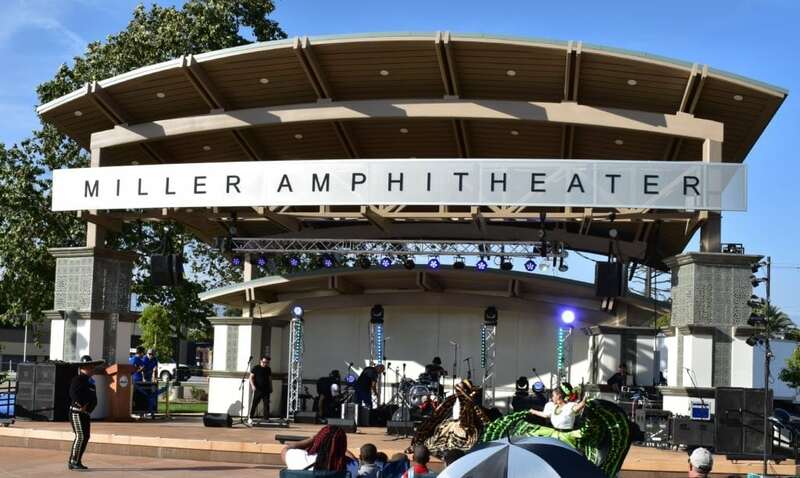 On May 10th, the City of Fontana celebrated the grand opening of the new Miller Park Amphitheater. The grand opening event included a ribbon cutting ceremony, live musical performances, food vendors and giveaways. What are the Key Features of the Miller Park Amphitheater? Before the Amphitheater was built, Miller Park held summer concerts and events using a small, portable stage. With the enhancements and permanent stage, the park will be able to host performances all year long. Working with BMLA Landscape Architecture, Vantage provided the audiovisual and IT infrastructure design and technical consulting for the amphitheater. This included working with the design team to develop space plans, architectural designs and infrastructure designs, and coordinating with the electrical, HVAC and other specialty contractors. Watch the time lapse video of the full construction of the Miller Park Amphitheater posted on the City of Fontana Twitter account. We developed flexible infrastructure designs for cables, optimized the sizing and placement of a portable screen for media viewing and determined the connections and placement for the speaker system. We helped the city plan for external public free wireless data connectivity and for comprehensive video CCTV coverage for public safety. Knowing that the amphitheater will be used for many years, we also built in flexible audio and video cabling to anticipate future needs. Vantage has done several projects with Fontana including the Fontana Lewis Library, the Jessie Turner Community Center and the renovation of the city council chambers. The Miller Amphitheater was originally envisioned as part of the library project, and it is great to see the concept become reality. Congratulations to the City of Fontana for creating a resource that will serve as a focal point and community gathering location for many years to come.